Monday night the Chiefs hung in and pulled out a huge OT win over the rival San Diego Chargers to get into a tie with the Bolts in the AFC West. 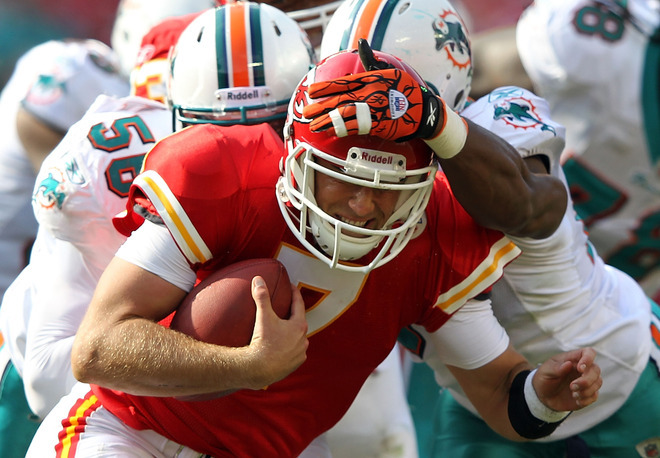 Six days later, their momentum was quickly out the window, as the game Miami Dolphins came into Arrowhead Stadium and buried the Chiefs to the tune of a 31-3 setback. Miami QB Matt Moore was a steady hand for the Dolphins with three TD passes, and the Chiefs offense was held at bay with a stellar defensive effort from the Dolphins. The loss dropped the Chiefs to 4-4 and a half game out of first place in the AFC West, pending the late afternoon games involving San Diego against Green Bay and Oakland against Denver. Moore threw for 244 yards while Reggie Bush ran for 92 yards and a score for the Dolphins (1-7), who were off to their worst start since going 0-13 to open the 2007 season. Miami recorded its first victory since December 12th of last year, when it earned a 10-6 win against the Jets. 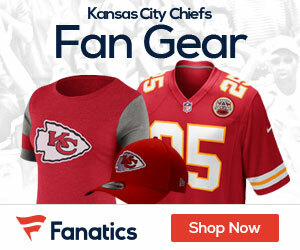 It started good for the Chiefs, as Ryan Succop nailed a 43-yard field goal on the first drive of the game to put the Chiefs up 3-0, but it was all downhill from there. The Dolphins went ahead 7-3 with a 3-yard pass from Moore to a wide-open tight end Anthony Fasano in the back of the end zone with 46 seconds left in the first quarter. It was that combo that struck again on Miami’s next possession, this time for 35 yards and a 14-3 lead with 9:41 to play in the first half. The drive was a three-play series, as Miami went right at the Chiefs secondary. Moore hit rookie fullback Charles Clay for 21 yards and then 22 yards before getting Fasano one-on-one on linebacker Derrick Johnson. The Dolphins defense never let up on the Chiefs, and Miami went up 21-3 lead midway through the third quarter on Moore’s third touchdown pass of the game, a 14-yard score to wide receiver Brandon Marshall, who got between cornerback Brandon Carr and safety Kendrick Lewis. Bush made it 28-3 with a 28-yard TD run with 6:41 left in the third period for a 28-3 lead, and kicker Dan Carpenter’s 42-yard field goal with 8:08 left in the game made it 31-3. Matt Cassel passed for 253 yards, but completed only 20-of-39 throws for the Chiefs. The Dolphins outgained Kansas City 351 to 343, but had nine minutes more of possession, and with Moore playing his best game by far of the year, the Chiefs seemed out of sync all day. The Dolphins’ relentless front spent most of the afternoon in Cassel’s face, sacking him five times and forcing the slow-footed quarterback to scramble nine more times. The Chiefs came into the game having allowed 13 sacks all season, tied for sixth-best in the league. Next Sunday the Chiefs will look to rebound as they host the Denver Broncos.